Eugene, population 154,620, has many attractions as a biking community. 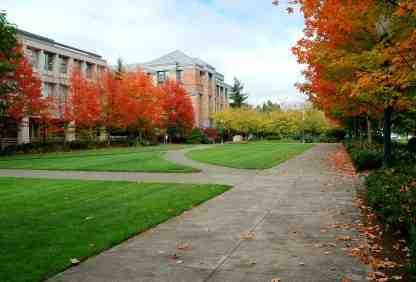 For one, it is a vibrant college town; 17,000 students attend the University of Oregon here. It has the Cascade Mountain range for unlimited hiking, skiing and outdoor opportunities like mountain biking. The wild and rugged Pacific coast is just an hour to the west. The city, birthplace of Nike, is famous for its extensive park system, which includes many bike and running trails. The university gives the community a decided liberal slant and cultural boost. Eugene, a city of over 150,000, enjoys a national reputation as one of the most livable cities in the country. As a retirement community Eugene offers small town charm combined with big city sparkle. It has a thriving and eclectic arts scene along with unsurpassed natural beauty. Its slogan is that it is “The World’s Greatest City of the Arts and the Outdoors”. Photo of Eugene Public Library courtesy of Wikipedia and Cacophony.